Vinyl siding is an extremely popular material that is used all over the country to cover the walls of homes. In many cases, brick will be used on the front of the home. Vinyl will be used on the other three walls. It is very durable and retains its color for many years. Just the same, the colors do fade after many years. Home owners who want their home to look great must make a decision. 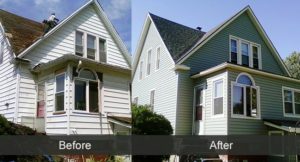 Should You Replace or Paint Your Vinyl Siding? Assuming that the vinyl is still in good shape physically, i.e. no holes or broken pieces, consumers can definitely consider painting the vinyl. If you do have to make repairs i.e. add a new strip of vinyl, it will be virtually impossible to match the colors. Your vinyl will have faded and changed color over the years. It is not possible to obtain an exact match. Painting becomes a very desirable solution. Although we always encourage consumers to obtain quotes for both scenarios, to confirm that it is less expensive to paint than replace, we feel that painting is less expensive and it is something you can do yourself. Complete Repairs – remove and replace any broken or cracked pieces. Clean the surface of the vinyl from a build up of dirt and chalky substance that may have built up over the years. Remove any mold from the siding especially under the eaves. Ensure you have a dry day with low humidity and light or no wind, especially if you will use a sprayer to paint the vinyl to avoid paint drift onto other surfaces. Use paint as close to the original color as you can. Avoid darker colors. Vinyl absorbs heat especially with dark colors and will expand and contract a great deal causing the vinyl to overheat and possibly warp. Use paint that is specifically made for vinyl siding. This paint is made to stretch and contract with the vinyl as it heats and cools. Spray painting works the best, however brush or roller painting works well especially on corners etc. Allow the paint to completely dry before applying a second coat. Follow the instructions of the manufacturer to ensure that your paint application will last many years. For more maintenance related posts, click here.